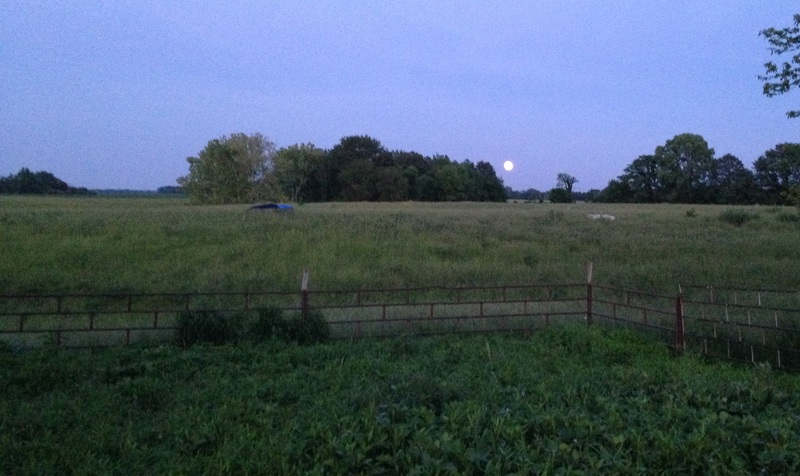 My lovely bride and I were taking a leisurely stroll through the pasture Tuesday evening at sunset. Well, that’s not quite true. We were closing up chickens at sunset, collecting eggs, separating the dairy calf and preparing to move one of the layer houses. But whatever we were doing, we saw something beautiful. Something my phone couldn’t quite capture. So as I show you the first picture, look past the ground trampled by the cattle during the heavy rains we had last week that has since been trampled by chickens. It’s a mess. But it’s a good mess. Instead, look at the trees in the background as the sunset imitates fall colors. A little later Julie and I were checking on the beef cattle and she stopped to take a picture. She was trying to capture the silhouette of the silo in the sunset. I tried too. The pictures don’t capture the beauty of the moment though. And they certainly don’t tell the whole story. Julie was excitedly telling me what she had read in Emerson’s Essays and English Traits earlier that day. There is too much I want to comment on in her reading so I am going to pare it down to the minimum and circle back around to sunset chores with my bride. You with me? Emerson essays, a pretty girl and a beautiful sunset all wrapped up with a neat bow. I think I can do this. I find Emerson impossible to read. I sometimes get as far as a full sentence without having to stop and reflect. College reading assignments required tight timelines. We just had to read and regurgitate, rinse and repeat. I didn’t do well. I don’t want to read and regurgitate. I want to read and reflect. I got a degree in biology instead of a degree in English. But the college thing is in my past. I still don’t have the time but I LOVE to read. Love it. And I enjoy reading Emerson…when I have the time to reflect on it. But quite apart from the emphasis which the times give to the doctrine that the manual labor of society ought to be shared among all the members, there are reasons proper to every individual why he should not be deprived of it. The use of manual labor is one which never grows obsolete, and which is inapplicable to no person. A man should have a farm or a mechanical craft for his culture. We must have a basis for our higher accomplishments, our delicate entertainments of poetry and philosophy, in the work of our hands. We must have an antagonism in the tough world for all the variety of our spiritual faculties or they will not be born. Julie and I are working together. And the work is hard. The previous evening I waded into the pond to convince the cattle they should stop imitating hippopotami and return to solid ground. After wading bare foot through surprisingly warm and mushy piles on the bottom of the muddy pond (yeah…) and swarms of insects, I returned the electric fence to it’s full, upright position and powered it up then washed the mud and manure off of my feet. This counts, in my mind, as antagonism in the tough world. It builds character. And strength. And callous. Our eldest was with us when I repaired the fence. Maybe I didn’t have the most pleasant expression on my face. Maybe I wasn’t the cheerful worker I would like to be. I am afraid he thought this was somehow his fault. And in some ways it maybe was but I certainly wasn’t mad at him. I really wasn’t mad at all. I just wanted to finish up and get home. The electric fence had been off. Had the electric fence been on it would not have helped as that leg of the fence was disconnected. These are things Julie and the boy had worked on only an hour prior to the hippogate incident. But what about the boy? What is his involvement? How are we investing in his character? Is the farm his? Mine? I don’t feel obligated to run the Tom Chism museum. Will he feel obligated to run the Chris Jordan museum or will the farm be truly his? These are the questions I was asking myself as Julie continued to share her reading with me as the sun set on a Tuesday evening in June. Consider further the difference between the first and second owner of property. Every species of property is preyed on by its own enemies, as iron by rust; timber by rot; cloth by moths; provisions by mould, putridity, or vermin; money by thieves; an orchard by insects; a planted field by weeds and the inroad of cattle; a stock of cattle by hunger; a road by rain and frost; a bridge by freshets. And whoever takes any of these things into his possession, takes the charge of defending them from this troop of enemies, or of keeping them in repair. A man who supplies his own want, who builds a raft or a boat to go a-fishing, finds it easy to calk it, or put in a thole-pin, or mend the rudder. What he gets only as fast as he wants for his own ends, does not embarrass him, or take away his sleep with looking after. But when he comes to give all the goods he has year after year collected, in one estate to his son,—house, orchard, ploughed land, cattle, bridges, hardware, woodenware, carpets, cloths, provisions, books, money,—and cannot give him the skill and experience which made or collected these, and the method and place they have in his own life, the son finds his hands full,—not to use these things, but to look after them and defend them from their natural enemies. To him they are not means, but masters. I don’t want the farm to master my children. I don’t want to enslave my children to my dreams. But I do want to share my dreams with my children. Maybe inspire them to have similar dreams. Maybe they will look past my own limited view and carry us further than I imagined possible. With or without cattle. 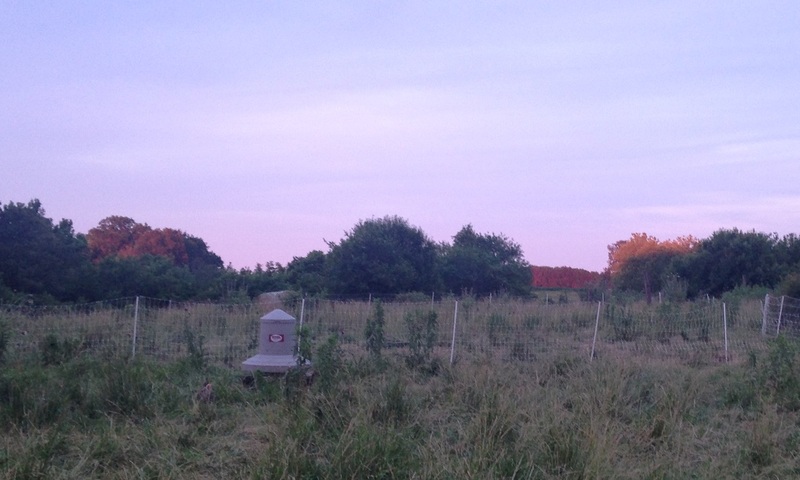 Julie and I bought a farm because Julie and I wanted a farm. Then we turned the kids loose. We played in streams. We caught frogs and crayfish. We played with kittens born in the barn or jumped from bale to bale in the loft. We went swimming. We roasted hot dogs and marshmallows. That’s a typical Sunday on the farm. Cows? Pigs? Eggs? Those are a means to an end. The means to an end Emerson spoke of above. The basis for our higher accomplishments. How much brain power is required to shovel horse manure? None at all. But that doesn’t mean we switch off. We think. We talk. We wonder how we can inspire the children and give them a real sense of pride, ownership, vision and place. We explore our perception of the world together. And we talk about how our reading impacts our thoughts today. My beautiful wife and I. Holding hands and watching the sun set over the barn roof. I don’t want to enslave my children to my chore list. I want them to have what Julie and I have. Their own dreams. Their own work. Their own thoughts. Further, I want them to be confident in their own thoughts. Confident in their own genius. Confident in their purpose. Emerson covers genius in the next chapter and I leave it to you, reader, to discover it for yourself. Where does the time go? You know all those things I want to do with my day? Well, there’s more stuff to do than there is day to do it. And it’s becoming a problem. I hate the idea that keeping busy is good. I don’t want to be busy. I want to get stuff done but not for the sake of keeping busy. I just want to get some things done. But I’m not getting anything done. I’m just busy. Arrgh! A typical day goes something like this: Get up at 5. Well, turn off the alarm at 5. Then lay there questioning my life choices for 30 minutes or so, fading in and out of dreams. Then I get up. Maybe wash a dish, maybe take out the trash, definitely make the coffee. If things are going well I see the cows and release the chickens in time to shower, dress and get out the door by 6:30. Then I have a whole day of misplaced priorities, good intentions, uncertain goals and a few people yelling at me followed by the evening commute…where, again, I question my life choices. Once home I butcher some chickens or build fence or just do whatever needs to be done until it’s dark and I’m forced to eat supper. By 9:00 I’m laying in bed wondering where my day went, why I got so little done and questioning my life choices one last time. Oh, Geez. I don’t have time to answer that question. I was an average to below-average student in school. I was not popular or cool. At. All. (I played tuba in the marching band.) How did that guy end up married to Julie? How/Why did Julie let me buy my grandma’s house? How did I make it this far in my professional career? Why am I asking you? I don’t know anything. Empty heads spill a lot of words. I would write on my blog more if I only had more time. I need to write on my blog. It forces me to learn. Forces me to stop and think about stupid decisions I have made in the past and document current choices for later regret reflection. It gives me a chance to listen to your thoughts too. But I don’t have time for reflection. I’m busy. Busy doing what? I really don’t know. It took me almost three weeks to set up a new laptop for my mom. It took me a month to build a new PC for the kids to play on. There is brush needs to be cut. Layers need to be moved. Portable shade structures need to be built. None of it is getting done. Hay wagons to repair. Barn repairs to be made. Home remodeling projects. No traction. It’s summer. That’s how it is. At least that’s what I tell myself. A reader, Kari, recently asked how I’m doing on my ambitious list of goals for the year. About what you would expect. The things I had to do have gotten done. Some things turned out to be wants instead of needs and have slipped to the side. And that’s how it goes. How are you doing on your list? It’s that time of year again. 90 degrees and 90% humidity at 7 in the morning. Good times. We are generating a lot of laundry. I sweat through all of my clothes before breakfast. Then I shower. Then I put on my office clothes. I wear long sleeves every day because I work in an air conditioned office but am acclimated to life outdoors. But long sleeves on hot days waiting for the car’s A/C to kick in…well, not the best idea. At the end of the day I put on a fresh set of work clothes which I sweat through while moving the cattle. I later set those aside because I will need to wear them again (however wet and/or smelly they are) when I close up the chickens at dusk. Then I shower again. Every day I generate a lot of laundry. A towel or two, two pairs of jeans, 3 or 4 pairs of socks…you get the idea. Julie also generates a lot of laundry. Let’s paint the picture more fully though. And I can do this without droning on about smelly work clothes. The grass is waist-high right now and we have been getting heavy rainfall. We need hip waders to get through the grass without taking a bath. Even on the days there is no rain the condensation on each blade of grass is enough to fill your rubber boots with water (Thank God my boots have holes in them to let the water out!). But the tall grass brings welcome relief from the swarms of hungry deerflies, desperate for a level of intimacy I don’t care to reciprocate. There is enough breeze on the ridges to keep them at bay but the valleys are hard to tolerate. I feel for the cattle. There are patches of horn flies on the backs of most animals, deerflies buzzing around and biting and huge horseflies here and there. Man do horseflies hurt when they bite! Why are there so many flies? Well, there are just lots of insects. More than I remember from previous years. More of all kinds. More dung beetles, more praying mantis, more spiders, more wasps, more solitary bees, more moths. There are more barn swallow nests than I remember seeing in previous years. More frogs and toads. But there are also more weeds. I started talking about my clothing but now it’s time for the real dirty laundry. I have a pasture full of flies and weeds. And I don’t like it. But I’m going with it and here’s the theory. I believe, perhaps naively, that what I am seeing right now is a return to soil health. Over time, as soil health builds, we will see a continued increase in plant and insect diversity but a decrease in the number of flies and thistles. For decades the cattle were allowed to make trails through my pastures. Those trails are beginning to heal now but the soil is massively compacted. The Earth doesn’t want to be naked. Right now it’s being covered by anything that will grow in that compacted and eroded soil. But over time things will calm down and succession will push forward. I see my pastures as being in their awkward teen years, covered in pimples and voice cracking. Hormones are out of balance, diet is poor, sleep is irregular. It hasn’t figured out how desperately it needs to shower and wear deodorant. But it will. Or I will. The pasture succeeds at pointing out my most glaring management mistakes but I see things moving forward. We have seen big increases in palatable grasses and clover density in some places. Other places, I think, just need a little more practice. A little more time. Time is the key factor. And the post is really about time, not about laundry. It’s the time of the year when we generate a lot of laundry. We generate a lot of grass. We generate a lot of insects. But time will soon change. The leaves will fall. Then the snow will fall and I’ll shiver under a blanket remembering those glorious days of 90 degree mornings. Right now I look forward to blankets and books. But the shine will wear off of that in January and I’ll start dreaming about hot weather and hay bales. 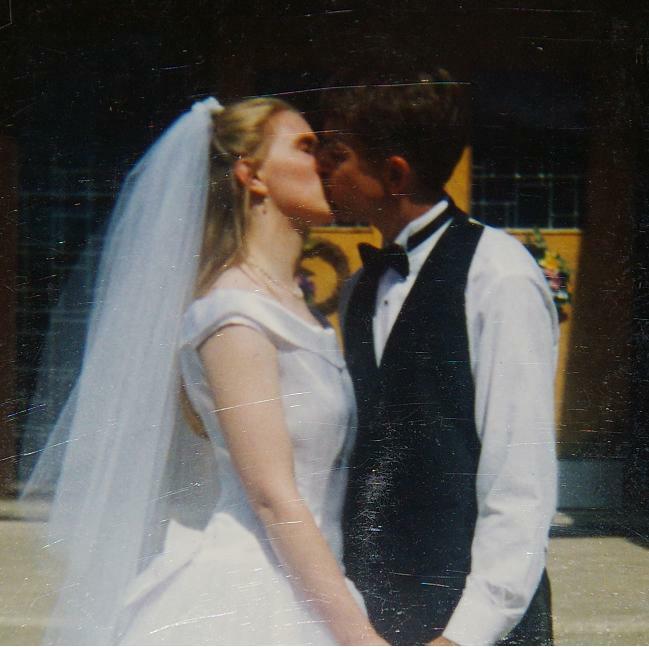 Our 18th anniversary is in two weeks but this blog post just won’t wait. I don’t know what I can say about Julie that I haven’t already said but I’m going to write it anyway. Similarly, I tell Julie I love her every time we talk on the phone…which is probably 5 or 6 times each day. I tell her I love her when I leave for work. I tell her I love her throughout the evening. I tell her I lover her before we fall asleep. Does she not know that I love her? Oh, she knows. But she still likes to hear it. And I like to say it. I need to say it. So I’m going to ask you to listen to it. It’s like I need to remind myself sometimes. I love Julie. I love Julie. And I really don’t know why I have to be reminded so frequently. We are easily fooled into believing silly things. I could easily fool myself into thinking she doesn’t love me. But that’s not true. It’s just my insecurity. So I battle my insecurity by seeking affirmation from her early and often. But we are easily fooled. How much do you hate your job? Do you know what happens when you make a concentrated effort to tell yourself how much you love your job? This is dangerous stuff. Get up tomorrow morning and write out 10 things you like about your job. Lie to yourself if you have to. Then for the next two weeks read that list to yourself every morning. Pretty soon you’ll be convinced…for better or for worse. For better or for worse. Do you focus on the worse of your spouse? Why do you do that? I believe God spoke the world into creation. Spoke it. I was created in the likeness of God. I guess likeness counts toward my looks but I really think “likeness” means more in terms of ability. I, too, have the power to create with my words. In fact, I believe I can create a wonderful relationship with my wife. But I also have the power to destroy that relationship. Death and life are in the power of the tongue. God also created marriage. And the enemy comes to steal, kill and destroy. Do we focus on how horrible our spouse is? How ugly? How fat? How old they have gotten these last few years? Why do we do this? SO, Mr. HeadFarmSteward (if that’s your real name), what the heck does this have to do with your farm? I want to farm. I don’t want to farm alone. There is no farm without her. I have a tendency to stew on things. There are times when Julie and I don’t see eye to eye. Or times when she somehow says the wrong thing to me. Or times when she doesn’t say the right thing to me. Or times when things just aren’t going well and I find myself stuck in a cycle of worry and fear and anger. Stuck in a place where I can only see the failures in my personal relationships. But that’s a lie. Dirty dishes are not Julie’s not-so-subtle way of asking me for a divorce. Dirty dishes are the result of supper eaten at 9pm because we were too busy to eat earlier in the day and too tired to wash dishes before crashing onto our bed too few hours before we have to get up and do it all again. Julie loves me. Why do I forget that? Let me tell you about a little my wife. Just in case you didn’t know. Julie is a strong woman. Not just physical strength. Grit. Tenacity. Determination. There are things she wants to do because she wants to do them. So she does them. She just does them…just makes up her mind and gets it done. I admire that in her. My opinion is certainly considered and she offers me respect but let’s be clear, she and I are equal partners in our marriage. I don’t tell her what to wear. She tells me what to wear (lol). The kids were recently talking about “my” new (to us) car, “Mom and dad don’t have their own things. They share everything.” I’m glad they picked up on that. I don’t have a new (to us) car. We have a new (to us) car. I didn’t tell Julie to stay home and raise our children. She is living the life she has chosen and is doing so with my encouragement. If she wanted to get a job I wouldn’t stand in her way. Thing is, she’s just too darned busy to get a job. My contribution is money. I work to pay for the farm. When I’m not at work I pick up the heavy things that she simply can’t manage on her own. I also advise on where to move the cattle. But Julie does the work. I work to enable her to live the life she wants to live. She works to enable me to have the things I want to have. We are a team. United and working toward a common vision. If you and your spouse are not working toward a common vision you will soon face the realities of division. I started down that road once. It’s a rough road. Almost killed me. I don’t recommend it. It is interesting to look back to 1993 when I met Julie and track the ways we have changed each other and changed together over time. 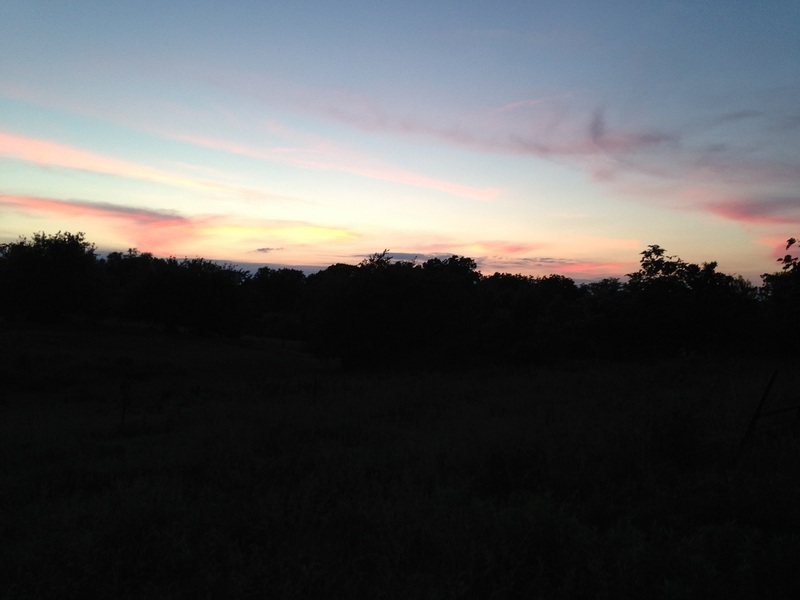 To look at the things we have gone through together…to look back at our hardships and stand together in the oppressive humidity and swarms of insects, holding hands as we walk through the pasture after finishing our evening chores. There’s an analogy in there somewhere. That time in the pasture is the time I focus on, not the dirty dishes. I love the few minutes we have together at night. Walking through the tall grass and hearing her yelp of surprise as her wrist buzzes. She is always surprised when her FitBit tells her she has taken 15,000 steps again today. I love my wife. I love her. Her. And in case you are not understanding me I’ll just say this plainly. Though I like Julie’s body, I love Julie. There is a difference. And it’s important. It’s not enough to be attracted to her. I have to love her. Truly love her. I respect and admire her too but that’s not enough. I love her. So each day I remind myself how much I need her and how much she means to me and I work to align my dreams with hers. It is unfair to her and damaging to our relationship for me to dwell on her failures. And she has failures…but not many. She loves me. And she, too, chooses to overlook my numerous shortcomings. Instead we lean on each other, depending on each other’s strengths. We work to motivate and encourage each other and remember our love for each other as we move forward together. Because we remain in this relationship voluntarily. And this one is a little fuzzy. And maybe it’s not for you. But it’s certainly for me. I love my wife. But I have to keep my priorities straight. I do not worship a creation. I worship a creator. All these things I do to train and retrain my thinking to stay married (and happy in my career)…I also do those things to remind myself that I have a purpose. That I was created. That I am not an accident. That God made me because God wanted a Chris Jordan in this place and at this time. In Psalm 103 David said, “Bless the Lord, O my soul and all that is within me bless His holy name!” Why did he say that? Because he needed to hear it. Because he was feeling discouraged and needed to create something within himself. He needed to create a positive relationship with God. Maybe because David was feeling alone and afraid. What are you creating in your relationships? Even if you don’t have a farm I’m sure you have a vision. Or do you have division? Farms are hard to divide. And, perhaps even more personal, what are you creating within yourself? Who do you think you are? You don’t have to tell me. But you ought to tell yourself. Death and life are in the power of the tongue. Oh, Despair! Woe is me! There is no end of weeds in my garden! I noticed them as I was picking the umpteenth gallon of strawberries. I’m so sick living with all this abundance! Poor me! That’s not a bad impression the “me” I hear inside my head. What a whiner. You know what man? Every day is the same. I go to a great job working with highly intelligent, highly skilled people I genuinely care about working on products that QUITE LITERALLY SAVE PEOPLE’S LIVES! Then I come home to a loving wife and healthy, happy children to find that my dad and my oldest son have already put up the hay. All I have to do is move the cows and close up the chickens. Maybe play some video games after I pull a few weeds while drinking something cold. 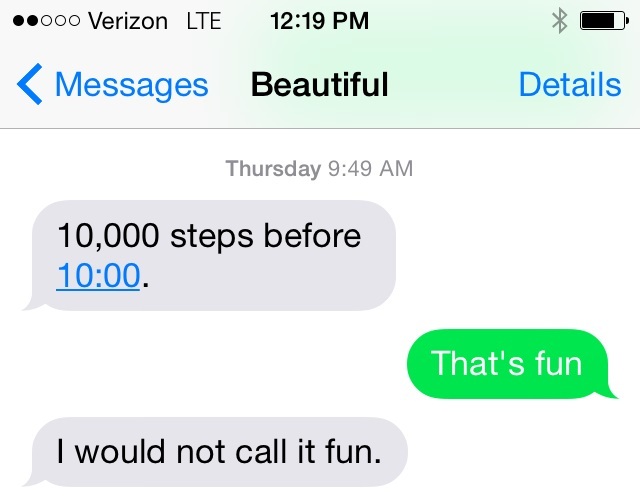 Then I kiss my beautiful wife and drift off to sleep in, as our FitBit reports, under three minutes. I love the movie Groundhog Day. I went through a spell of watching it every day. In the movie, every day was the same. The same. Same kid falling out of a tree. Same groundhog. Same prediction. Same episodes of television game shows. Nothing ever changed. The main character changed. Punxsutawney didn’t change. Just Phil. I’ll come back to Groundhog Day in a minute. This week I am reading The First 90 Days by Michael D. Watkins. I am reading it. Present tense. I read a page, exclaim, “WOW!” then go read that page to Julie. Then I sit and think for a little while. I’m not going to share quotes. I just want to make a record that I’m reading this now. The book makes a study of management transitions and how to set your team up for success. I’m in my first 90 days of a new assignment. While I seem to be fine with sharing my farming and fathering insecurities, I have real reservations about sharing my professional insecurities. But I have them. One thing I will say is that I currently have a level of anxiety I have never faced before. Not even once. I am afraid. I’m not afraid I will get fired, though. That’s something of a concern but it doesn’t keep me awake. My co-workers and customers are patient with me. They seem to understand that I have accepted a difficult assignment. I think I’m just afraid that I will let my team down…somehow. So that’s enough about work. The Chris that goes to work is not the Chris that writes this blog. Different guy with different interests. But sometimes it is so completely taxing to pretend to be him all day that I have nothing left to give at home. And to get back to the Groundhog Day analogy, we’re talking every day. Every day. Monday dad cut hay. The New Chris (the one with anxiety issues) sat and worried and watched the weather forecast and hoped the rain would go around us. It did. All week long. It poured rain just across the river. Not a drop here. Friday the sun was shining and dad was baling. The boy was out helping him. 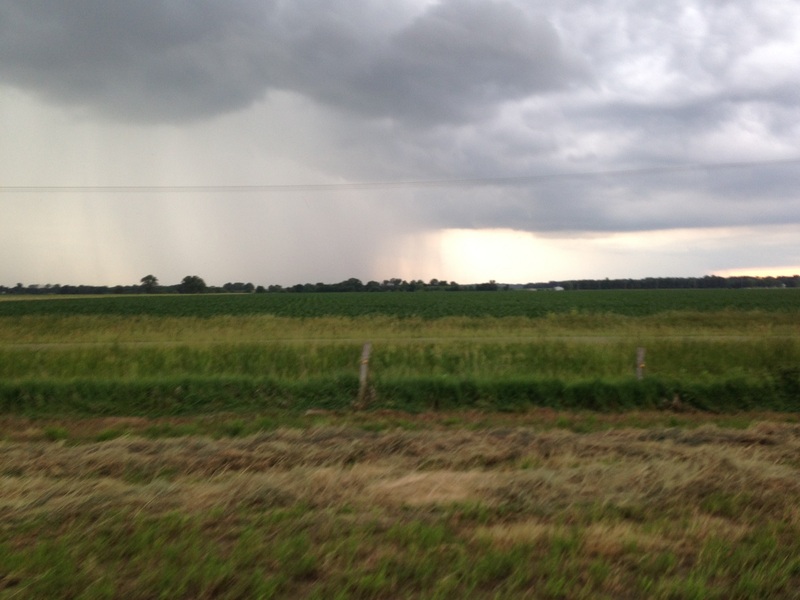 They had two wagons loaded when I got home from work…just as we were surrounded by showers. We live on the plains. You can see rain coming in from a long way out. 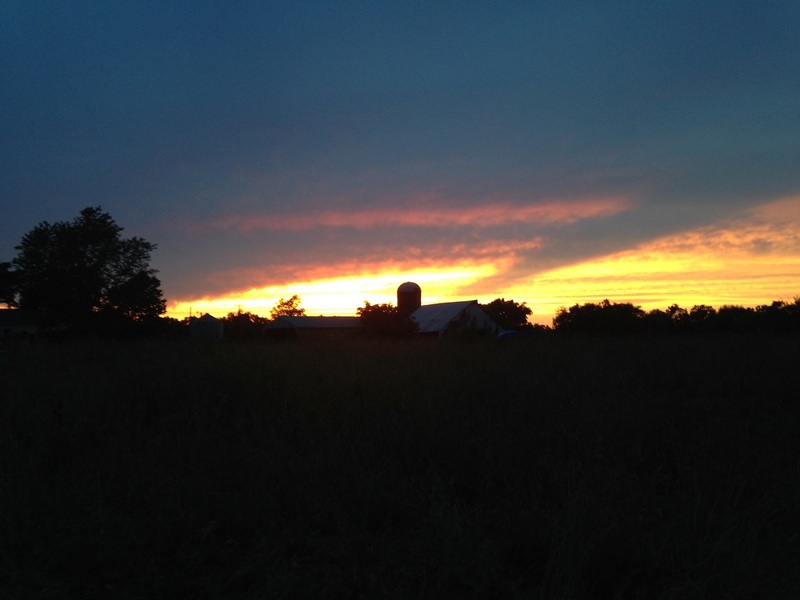 I went to get a fourth hay wagon and looked to the west. Sigh. The good news is we had the hay baled. The bad news? All four wagons and the baler were getting a shower. Dad and I hustled to get things pushed under roof as fast as possible but something was boiling up in me. Something, in fact, boiled out. The last hay wagon needed to go in the barn and, wouldn’t you know it, the sidewall of the tire blew out. Hilarious. Standing in the rain. Can’t push a loaded wagon with a flat tire. Just happens to be the best hay from the field too. Dad was trying to back the wagon in with the tractor but that tire is a drag. I ask the oldest boy to make sure we didn’t hit a pole. I guess he started daydreaming about whatever it is 14 year old boys daydream about and I snapped. I rarely lose my cool like that. But when I do it tends to be with people I care about the most. The hay wasn’t that wet. The day wasn’t a bad day. Flat tires happen. But on top of a week’s worth of tension from my job it was all too much for me. When I snapped it made it all about him. Listing his failures, his constant, endless, limitless shortcomings. That really doesn’t make the situation better for anybody. I caught myself mid-explosion and just stood in the rain watching my enormous 6’2″ child shrink before me. My father never did this to me. Even at this moment, he stood back and let me work it out for myself. I wish it was Groundhog Day. I wish I could do that over. I can never un-say words I said to my son. Somehow I manage to avoid these situations in my professional life. Somehow I keep my cool under pressure. I had a situation recently where a server went offline on a Monday morning. I had never heard of this server before and had no idea how to fix it. Worse, I slept through the notification call. When I realized the situation I only had one course of action. I had to get that server online ASAP. That’s it. I couldn’t fix it remotely so I drove on in to work hoping and praying that the solution would be clear. The whole drive I cried out for help from the Lord. “Great is the Lord and Greatly to be praised!” “I know the plans I have for you, says the Lord. Plans to prosper you and not to harm you.” I stood on God’s strength because, while I know I promised not to share my professional insecurities with you, I am not really a computer genius. I’m just persistent. Within 5 minutes of getting to work I had the server back online. Whew! But the enemy comes to kill, steal and destroy. That was the beginning of the worst week of my entire career. Everything went wrong. But I never lost my cool. Even when under personal attack. So why did I lose it with my son? I hope we never have a flat tire on a loaded hay wagon in the rain again. But, really, every day here is the same. The chickens need us every day. The cow needs milked every day. The garden sprouts new weeds every day. There are always dishes to wash. There is always laundry to put away. It seems they are always the same dishes and the same laundry. It’s Groundhog Day. Every day is the same. And nothing I can do matters. There are things I can do. Things that matter. Things that lessen the burden on those around me rather than multiply them. My son has 14 year old insecurities. He doesn’t need me to list his faults. He, like me, is acutely aware of his own limitations. Every day he needs me to show him how much I love and appreciate and cherish him. How grateful I am that he is my son. How proud I am of the man he is becoming. In Groundhog Day, the day finally changed when Phil changed. Goofy movie. Sure. But I think I can change our day for the better. Child #3 (age 10) was getting ready for church recently and I heard him make an alarming noise. Not quite a scream. Not a yell. Obviously somewhat distressed. Something bit his foot when he put his shoe on. Something the size of the baseball. I should clarify, it didn’t bite him. He felt a pinching sensation on his toe through his sock but there were no puncture wounds. 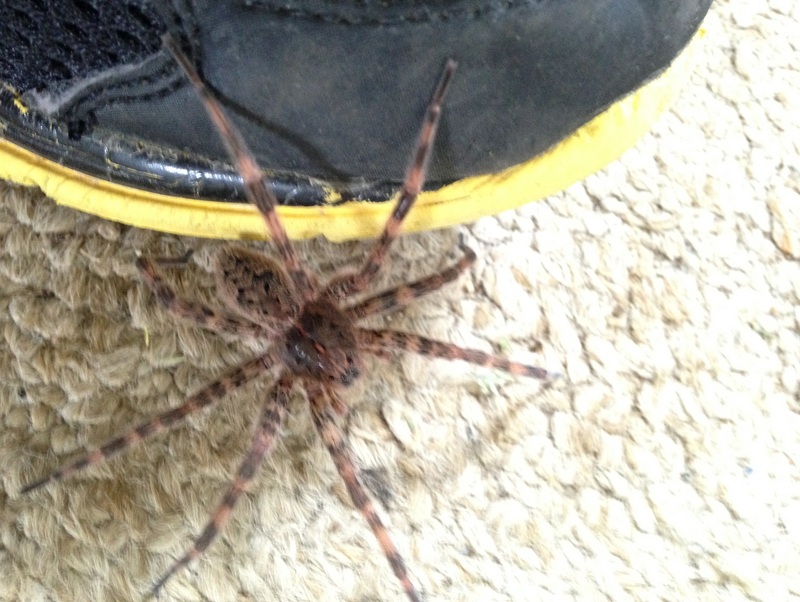 This is a big but fairly harmless and secretive grass spider. It builds a funnel trap. Guess the shoe was a natural funnel. Dunno. But it was good times for a few minutes there. What a day Tuesday was. What a way to end the day. Allergies hit me Monday night. Wicked sore throat all day Tuesday. Busy at work. Stuff to do at home. No end. No end. But we can pause. Look at that sunset. Since we’re standing here, let’s just keep standing here. What’s it going to hurt? We have hay down. Not much but some. There is rain in the forecast for the weekend and temperatures are a little on the cool side so we didn’t go bananas cutting hay. Just a few acres. Do you know what a relief it is to have hay down? And to just have a hundred or so bales worth of hay down? Knowing my 1.5 scale human 14 year old will be home from a mission trip on Thursday to help put it up? That’s awesome. Flora left the farm today. Flora was one of our first cows. A Jersey. A beautiful easy keeper with a great attitude and very forgiving of my ignorance. She always gave us bull calves. Small handles though…like thimbles. Flora must have eaten something this winter…wire or twine or…? We did what we could but she never really came around. Stood hunched with her mouth open drooling all the time. Oh my gosh I don’t want to cry. We could have allowed her to suffer until she died but that’s not fair to her. So we shipped her. And that’s not fair either. But I couldn’t fix her. It’s not fair. But that’s how it is. Dad asked what I would do with him when he was no longer productive. Cows do not equal people. I value people beyond their productive years. I do not operate a retirement community for cattle. I understood dad’s question though. This was a difficult issue for all of us. Maybe our Old Yeller moment. Really don’t want to cry. Flora is not the only cow we will ship this year. There are at least five others. One steer who will be delicious. One poor-doing heifer we will put in our own freezer. Two 3 year old heifers who have never bred and never will. And Mrs. White. Mrs. White is as big as an elephant. And, with the vet’s help, she gave us a calf that is almost as big as an elephant. Her size (must be 6′ at the hip!) and her calf disqualify her from the team. Plus her calf is just as watchful as she is…eyes wide in shock that we would dare to exist in her pastures. I knew cull rates would be high early on but…wow. Just wow. You have these ideals in mind when you begin farming. This vision of how it will someday be. It’s a long way to someday. A long, difficult path full of uncertainty. Every choice seems to require compromise. 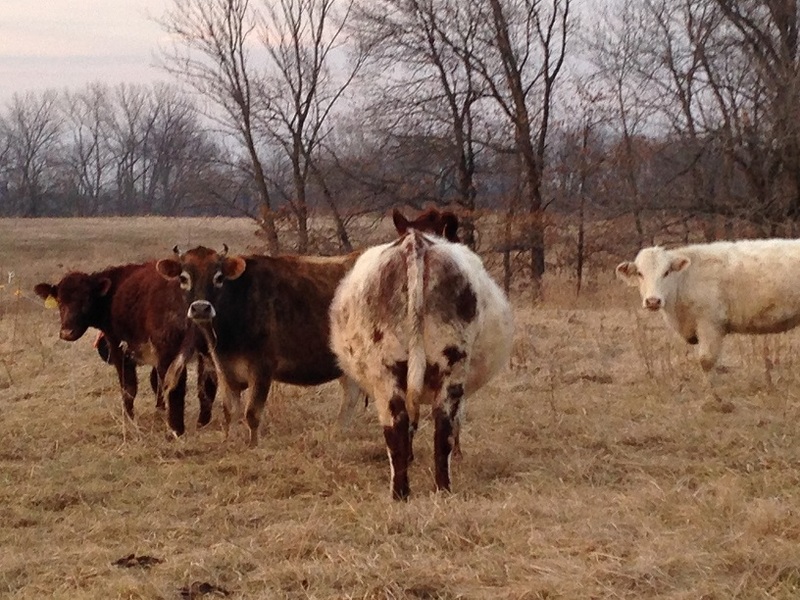 Keeping my dairy cows on pasture in the winter is good for my pride. Keeping them inside in the winter is good for my dairy cows. Sigh. So now what does that make me? 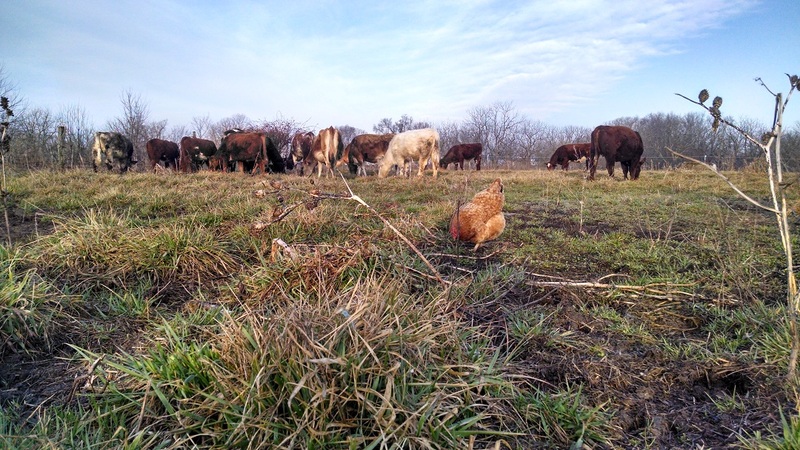 Am I a pastured, humane livestock farmer or am I just conventional plus? I think I’m just doing the best I can with what I’ve got. And what I’ve got is, apparently not well adapted to my forage, climate and ability. So now what? I have 5 animals to sell. Do I replace them with 2x the heifers? Do I just replace them with cows? Is there something else I could do with that money to earn a better return? Heifers or cows? I see the advantages of each. With heifers I get more rolls of the dice trying to find appropriate genetics. With cows I get proven breeders. Dunno. I really don’t know. So let’s table that for the moment. Dung Beetles. We have found a few dung beetles here and there over the last few years but this year there seems to have been an explosion of them. Small green beetles the size of a dime, black beetles the size of a nickel or even huge half-dollar sized ones that dig huge mounds of dirt next to cow pies. Amazing. What has caused it? Is it simply that we don’t worm our cattle? Maybe. Is it that we subdivide our farm and encourage our cattle to spread their manure over the whole thing rather than concentrate it in favorite loafing areas? Sure. But let’s talk about that subdivision thing. 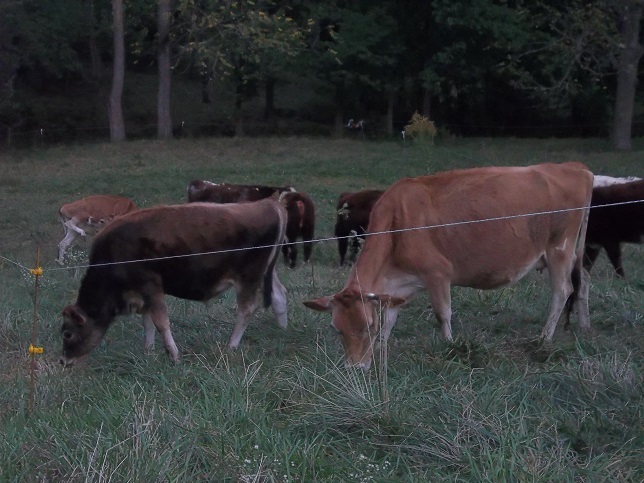 All spring we have split 30 acres into 10 pastures and rotated the cattle daily. Early on I was freaked out that the grass wouldn’t recover. In some cases it wouldn’t have. 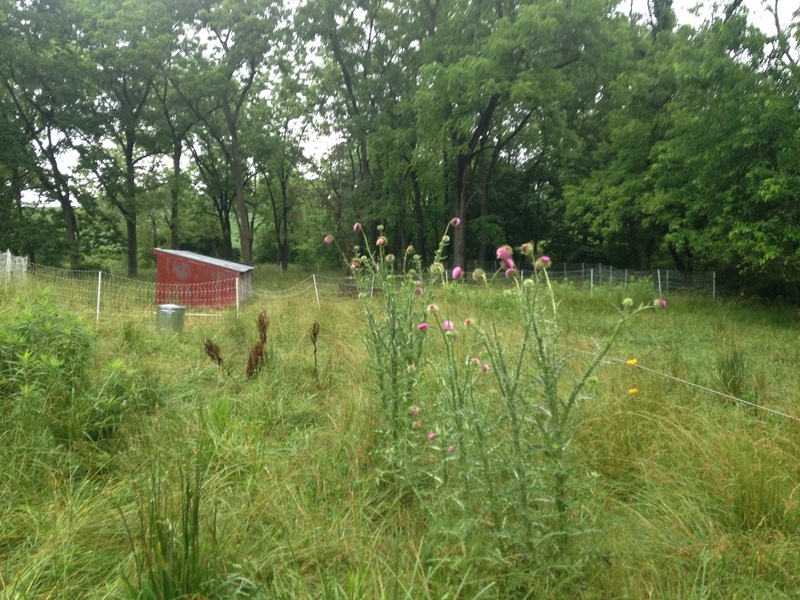 We had some hard rain in April that forced me back to the barn to save the pastures. That gave us a few days of extra recovery time. In May it dried up and the grass simply stopped growing so we made a 15-day pass by adding a few additional subdivisions. But we have circled the farm four times in 61 days. Not bad. Now we slow it down. Last summer I had some correspondence with Mark Bader. My cows weren’t shedding out well. He suggested this was not a mineral deficiency but, instead, an energy deficiency. He said I should move them faster around the farm and allow them to be less selective. That’s what I’ve done. Our star players are all slick. The rest…well, I listed them already above. They need to go. So we are cutting those ten pastures into 20 pastures. More than that over time as the grass slows growing. The idea is to allow sufficient recovery between grazings so we are moving plant succession forward instead of setting up for a big weed crop. Now, I buy into that theory pretty well but not entirely. Not entirely. I have a hill that is covered in goldenrod every summer. I can’t seem to beat it. Maybe I need more cattle but this year I’m going to clip that pasture behind the cattle then spread compost and lime on the hill. I have to admit, though, that there is an incredible clover crop out there in places that have only grown moss before. Let’s hear it for hoof prints! But the goldenrod and I have a date with destiny. It’s getting dark. Full moon is coming up to the east. I really ought to continue my chores. I first make sure Mable and her calf have water, shut off the water to the cows in pasture and am joined by Julie as I gather the last of the day’s eggs and close up the chickens. She, too was taking pictures of the sunset and the moonrise. We are humorously frustrated that our phones can’t take better pictures. That’s about as much of a summary the farm as I can offer. Every day is pretty much the same. Right now we are picking at least a gallon of strawberries every day. Soon that will switch to black raspberries and dewberries. More sweat and thorns but basically the same. I’ll still be weighing cows vs. heifers when the raspberries come on. The same moon will be coming up. The same sun will be going down. In spite of some serious setbacks it’s a good life, really. I know I fuss about it quite a bit but this is a great way to raise a family. A fun place to be. How About We Write Something? Ah, I remember my last blog post like it was yesterday. In fact, I really don’t remember my last blog post. Probably lamenting farming or pouring sickeningly sweet words on my wife. It has been a while. Maybe too long. Can I still do this? Do I still have readers? Management is very different than…not-management. Let me tell you. Wow. The things I didn’t know. The things I wish I didn’t know. Farming isn’t quite what you read about in the magazines. It’s not all fluffy bunnies and fresh strawberries. There is a fair portion of blood and manure and sickness and vet bills and sweat, hard work and sometimes the only sleep that can be had is when you are traveling in a car. Hope you’re not driving. Management is similar. Less blood. Same amount of manure. Replace the vet with a talent recruiter, cull out the non-performers and drink a lot of alcohol and you’ll have the idea. Not sleeping well. Not coping well. Mostly this is an adjustment period. I don’t think it’s bad. Just an adjustment period. I have been forced to grow and that growth has come hard. Look, man, I know you think this is a blog about farming but it’s not. It’s just not. It’s a blog about a farm. And I’m the farmer’s husband. So I’m going to tell you how it is on the farm. We start our day early, milk the cow, unleash the chickens, check feed and water, shower, shave, get dressed and roll on in to work. Then people throw stuff at me for several hours until I come home to move cows, check water, gather eggs, have dinner, close up birds and fall asleep on the couch. Somebody does the dishes. Somebody cooks. Somebody does laundry. Somebody mows the grass. I don’t know who. I just try to make sure the things we need are where we need them so the work can get done. And along the way I try to reinforce positive relationships with and between the people I depend on. I just hope Julie doesn’t quit. I don’t think I could take that right now. I love you Boo. You are my favorite person. I need you! I’ll try to make this blog thing happen again. I treasure the people who make time to read my nonsense. Much of my writing is more asking than telling. More wondering. Me admitting that I have no idea. I enjoy when readers take the time to minister to me or help me to puzzle something out. Thank you for your patience. I promise to post something tomorrow…even if it’s just kitten pictures.